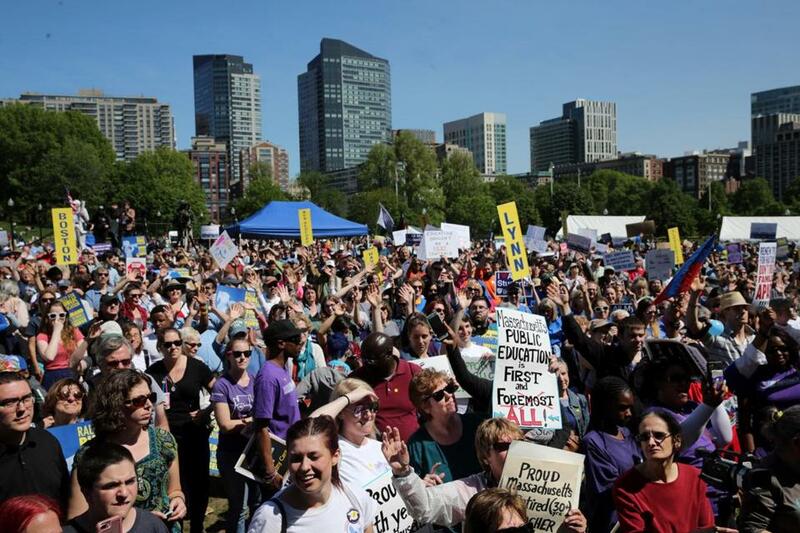 More than 1,500 people attended a rally for public education at Boston Common on May 19. The Boston Teachers Union overwhelmingly approved a two-year contract Wednesday that includes a 5 percent wage hike, additional school nurses, and a commitment to reexamine the amount of standardized testing taking place. “There are a lot of big wins in this contract for our students,” said Jessica Tang, the union president in a brief interview after the vote, noting measures that will support students’ social-emotional learning. The $42.6 million contract replaces an agreement that expired last August. It gives the 6,500 members, who include other educators, such as guidance counselors and teacher aides, a 2 percent retroactive pay increase for the past school year and a 3 percent raise for the current year. The union and school officials reached the deal in August after 18 months of talks, which were marked by occasional public acrimony, such as earlier this year when the overwhelmingly female teachers union criticized Mayor Martin J. Walsh for quickly settling contracts with male-dominated unions like the police. The talks ultimately hit an impasse in May, prompting the teachers union to successfully seek intervention by a state mediator. The deal includes provisions that will likely please some parents and students: It will guarantee that every school has at minimum a half-time nurse and establishes a committee to study and make recommendations on the appropriate use of standardized testing in the district’s 125 schools. Many teachers went into the meeting with questions but decided the contract was worth passing. For instance, she noted that for students to receive more individualized attention, teachers need smaller class sizes or course loads. Maximum class sizes in high schools are set at 31, and teachers can teach as many as five classes. Some teachers said they were disappointed the contract was for only two years and they had to negotiate some basic needs for their students and themselves, such as a guarantee that bathrooms will be cleaned and stocked. “When you look at what we received, it’s not the best package, but we can live with it,” said Darren Wells, a science teacher from Dearborn STEM Academy in Dorchester. Walsh, who is running for reelection this fall, has taken some heat for the deal because the school system was unable to push through some key measures, such as gaining the ability to terminate permanent teachers who do not find new classroom assignments during a certain period of time. The school system has said these teachers cost millions of dollars annually, but the union has argued the teachers still provide a service by working temporarily in such roles as long-term substitutes. None of these teachers sits at home while collecting paychecks. The School Committee, appointed by Walsh, unanimously passed the contract Wednesday night.